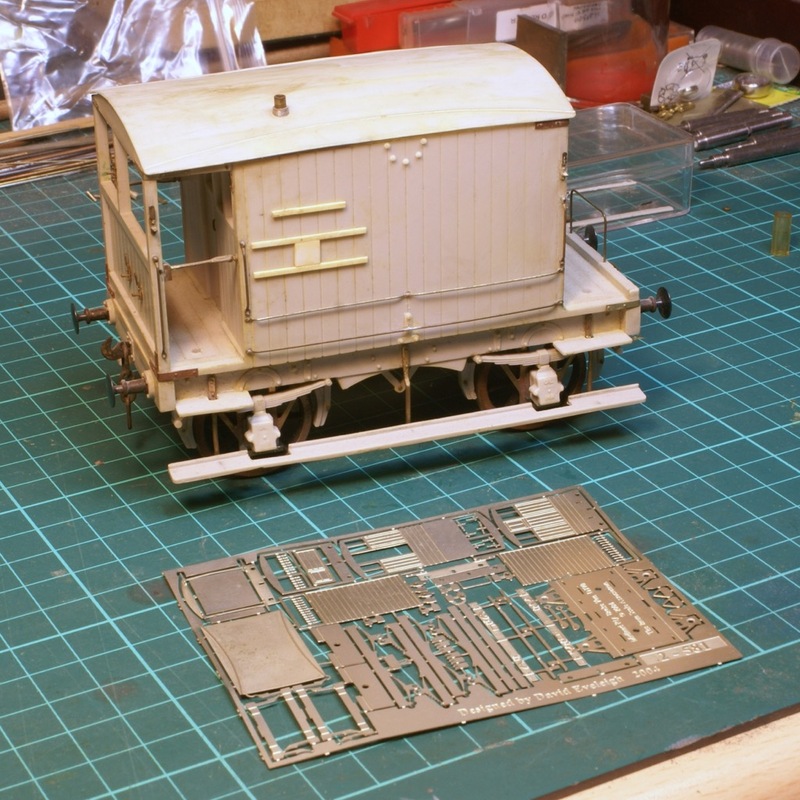 Having just started out having a go in 2mmFS I decided to start with a small wagon kit. 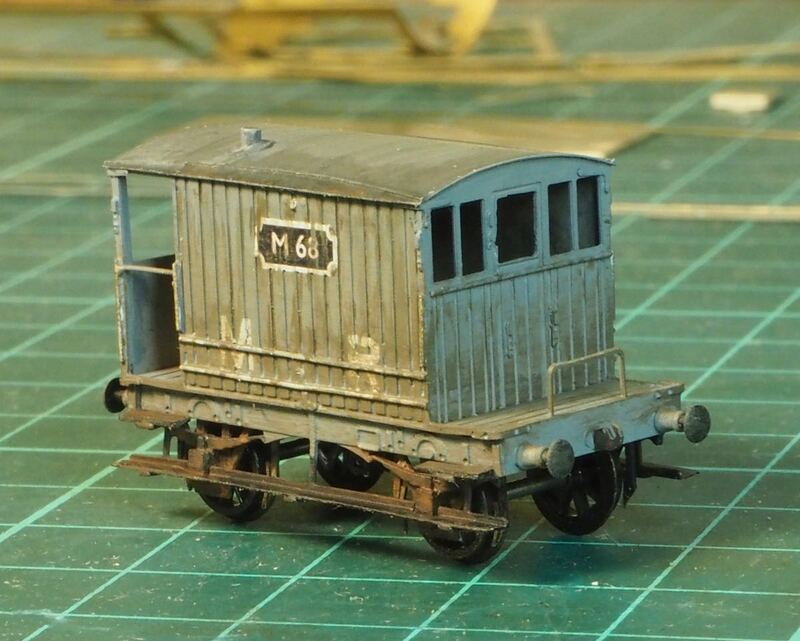 So this a quick photo build of the MR 10T brake van available from the 2mm Scale Association. 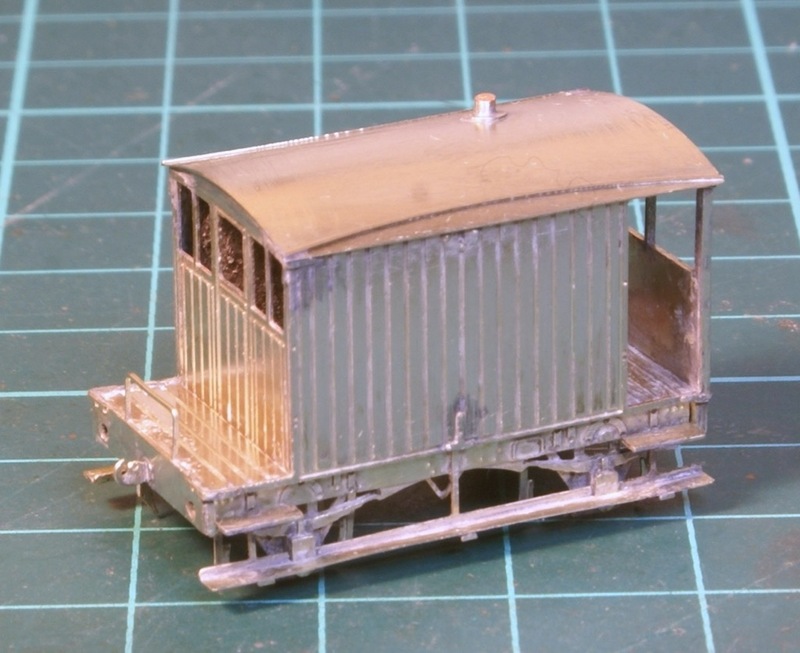 I had been given in the past a Slaters 7mm 10T brake van so I had something to work from – this shows the Slaters version with the 2mm etches purchased infront of it. I started by separating out the various body etchings and overlays to sort out what went where. I then folded up each end. The photo I was using showed widows in the doors so these were cut out in the etches. The buffer beam overlays were lined up using a couple of cocktail sticks. 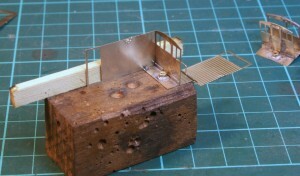 The inside angles were soldered in and a 10BA nut soldered in place for bolting the chassis in later on. The sides were then tacked in position. Attention then turned to the chassis. 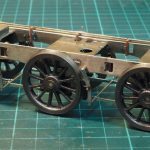 The chassis was folded up and the overlays for the springs soldered on, brass wheel bearings helped to locate the overlays. 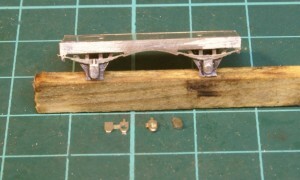 The axle box covers are folded up. 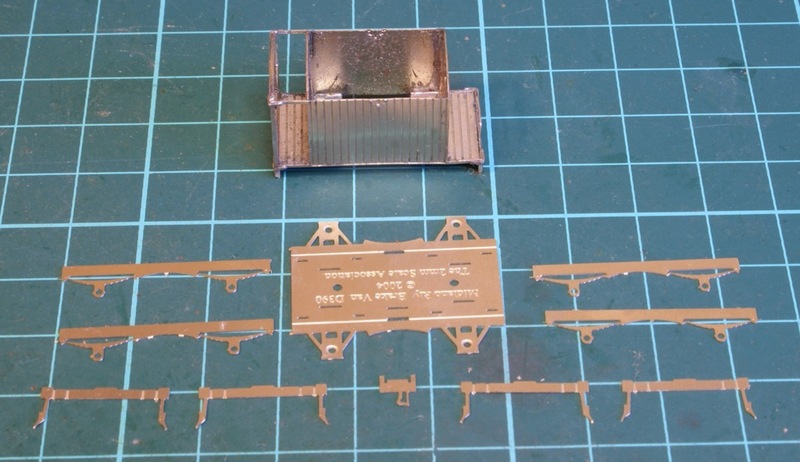 On the chassis the left-hand box has been fitted, in front it shows the stages in making the covers – on the left is the etch as supplied, in the middle the etch has been folded over and soldered, on the right the cover has been cleaned up and the fold tab has been filed off. There is just enough of the wheel bearing protruding to locate the cover. Then all the brake gear is folded up and slot into the chassis. 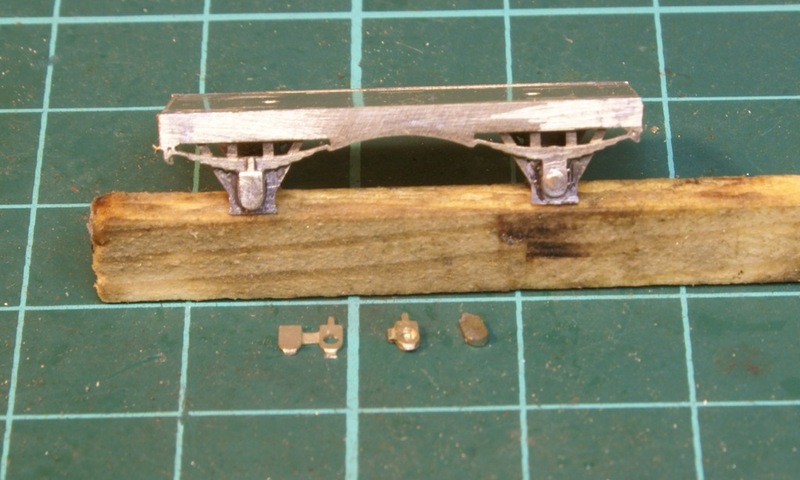 Next was making up the footboards – there is small half etch where it goes around around the axle box – this was left in place whilst soldering up the footboards and then removed later. The little tabs are for supporting the short steps by the gangways. 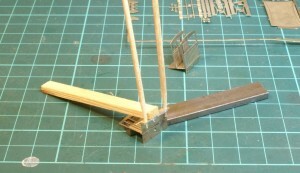 The slot going around the support leg for the lower footboard. These were a real pain to get sorted as there wasn’t much in the way of positive location so every time I tried to solder the short footboard on, the bracket would detach itself from the chassis. 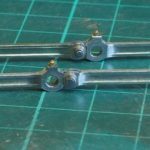 Next time I think I will try silver-soldered these brackets to the footboards first so they can then be soldered to the chassis as one unit. So with the footboards all fitted and roof fitted we are at this stage. I thinned down a 12BA washer and stuck a bit of copper wire through it to represent the stove chimney. 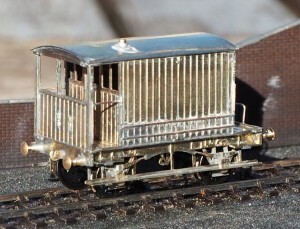 Final fittings were buffers, lamp irons and handrails. 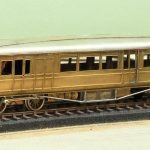 The handrails are just some fine copper wire soldered on. I have seen some models in this scale where they have fitted separate handrails but just getting the lamp irons in place was tricky enough for me. I wasn’t going to fold them up in this scale! I thought if I tried to drill the holes for the handrails any slight error would be immediately visible and just soldered on I could adjust them enough and once painted they can be picked out in an appropriate colour. So it has gone to the paint shop. 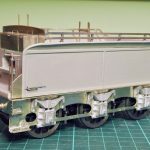 It still needs another coat of grey as the coverage is poor inside the gangways, I think the sole-bars on the chassis should also be grey so that will need masking up and painting. 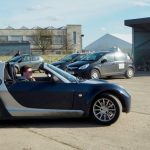 Also I’m still trying to decide on a suitable colour for the roof, I’m thinking a much blacker looking grey at the moment. 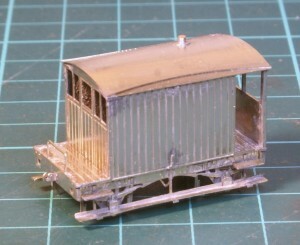 Finally I’m just waiting for some transfers for it and the LNWR van to finish it off. 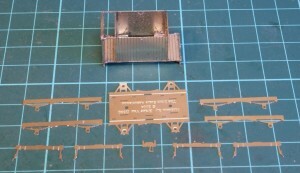 I managed to get the MR transfers, these had to be cut in half and aligned carefully either side of the handrail. The numberplate had to be made by printing a black panel on white transfer paper. This was cut out in a rectangular shape and a dot of grey paint in each corner to try and give it the scalloped effect.